Why would anyone want to go ice fishing? It can be bitter cold — and windy. I’ll tell you why: Because if they’re biting it can be fun, and you can have fresh fish in the winter! Plus, don’t you ever get cabin fever and just have to get outdoors and do something? Ice fishing is a huge sport in Minnesota, Michigan and some of those states. They drive their trucks with their campers out on the lakes and the whole bit. Sorry, hate to be a little wimp, but I’d be scared of dropping through on this one. Speaking of dropping through — that scares me, too. The ice creaks while out ice fishing and makes weird harmonic sounds as it cracks and shifts. Wonnnnkkkkkk as it cracks and runs between you and your buddies. To deal with this danger, many people tell you to carry a long rope to throw to someone if they fall in and a sled to disperse your weight so you can get to them. One time I was ice fishing with Mike Helzer in Nebraska, and it was warming up and had melted the snow on top of the ice. If we caught a fish and three of us ran to the hole, the ice sheet would start dipping down. But enough on this or you’ll never go ice fishing. The gear is really pretty simple. You’ll need an ice auger to drill holes so you can fish. The more holes you drill the better or you’re stuck in one spot. You don’t just fish in one spot in the summer, do you? No, you move around. The problem with ice fishing is that to move around, you have to drill a hole every time. For this reason, many people prefer a gas-powered auger. You can have as many holes as you want, but they can’t be over 10-inches in diameter to prevent people from falling in if snow drifts over the hole. And ice fishing, you can use up to five rods and each rod can have five hooks on it. You’ll also want an ice ladle. As ice starts to form in your hole you’ll want to scoop it out. You’ll also want a ladle to scoop out the slush you made when drilling the hole. 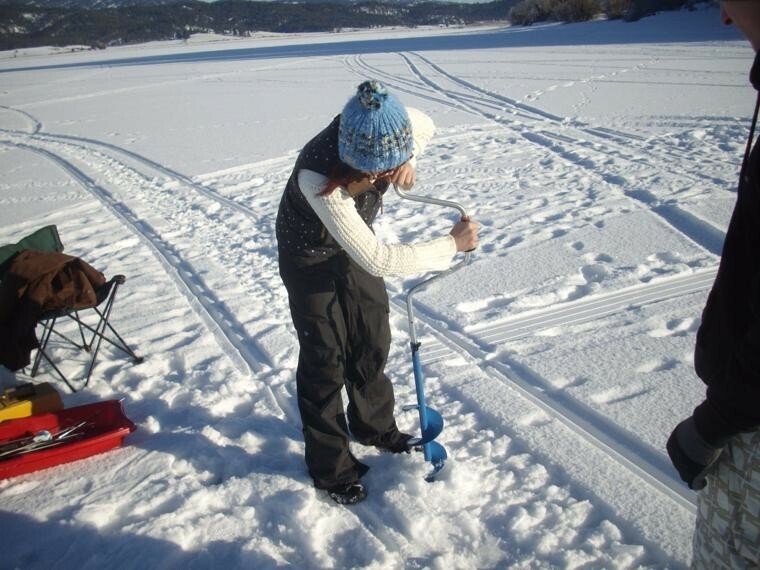 Ice fishing rods are shorter than your normal rods so you can maneuver fishing in the hole. They make short ones that look like a miniature crappie fishing rig, only about a third as long. A cheaper option that most people use is tip-ups. They’re a small rod with a spool for a reel. In the winter, fish will be more lethargic so you can handle them on the smaller ice fishing rods. Because they are lethargic, you’ll want to move your jigs a little slower. A lot of people put a meal worm on a small ice fishing jig. Some drop larger jigs and pick them up and drop them slowly down the water column. You can also use regular worms on a hook or jig. Perch like cut bait, so cut a piece of skin off of a fish. I catch my perch about a foot off the bottom. Try trout a little higher up. But you’ll want to fish up and down the water column to find out where they’re feeding and then fish there. Try for perch in about 20 to 25-feet of water. You don’t need to worry about a stringer and keeping them alive. Just throw them in the snow on the ice. Five-gallon buckets work great to carry them in. Needless to say, it can get cold, so wear plenty of layers. Wear heavy boots and some good Browning Wool Socks. Hand warmers are nice. Take a chair or bucket to set on so you’re comfortable. I don’t have an ice hut, but there are some nice portable ones on the market. Back East, you see pics of ones that people make that look like big outhouses. They’ll even have floors and holes in the floor to fish through. They’ll have heaters and the whole bit. I carry a tent heater, or you can build a fire. It works well to throw all of your gear into a sled and drag it out to where you’re going to fish. Have fun.